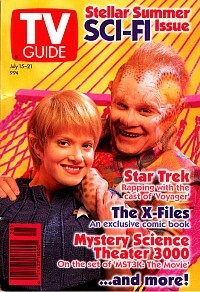 Few TV series debuts have been as hyped--or as troubled--as that of UPN's Star Trek: Voyager. From the seemingly endless search for a female Captain Janeway (played for two days by the unwisely cast Genevieve Bujold, then recast with the triumphant Kate Mulgrew) to the headachy task of getting this multimillion-dollar, FX-laden epic on the air every week, the Voyager stars have had very little time to relax, much less ruminate. So, on the last day of their first season, we brought these nine exhausted, punchy players together on the set for their first-ever communal interview. Robert Beltran (Chakotay): I want to admit right off that I flub the most lines. Beltran: You know, the one who came in after...I forgot her name--you know, Anne Boleyn. McNeill: I guess Miss Mulgrew must set the tone--because there was a different tone before she got here. Beltran:(laughing): There was no tone before she got here. Tim Russ (Tuvok): There was a lot of anxiety getting started. McNeill: She gave us all confidence. Roxann Biggs-Dawson (B'Elanna): After we lost Genevieve Bujold, there was a little bit of terror that this might not happen at all. TVG: You mean, that nobody could be found to play Janeway? Russ: No, that they might be forced to cast a man and that would have a [domino] effect on the rest of us. Garrett Wang (Harry): Some male roles would switch to female and [vice-versa], so some of us might be out of a job. Kate Mulgrew (Janeway): The mutual support here is extraordinary. In a cast this size there will invariably be one bad apple-but there isn't. Ethan Phillips (Neelix): That's because we can go months without playing a scene with one another. Biggs-Dawson: It's true! Here we've finished our first season and Ethan and I have only had one or two lines together. I really haven't had lines with Jennifer at all. Jennifer Lien (Kes): That's because Ethan and I are the alien outcasts. Phillips: But as Neelix and Kes's love continues to grow, we will discover each other in ways the others can't. We are the principal love interest. Lien: We are the only love interest. TVG: The audience has really taken to this beauty-and-the-beast pairing. Lien:: -chick with funny ears. Phillips: Neelix is intensely...how should I say it? Lien:: Virile! A true hero. A man among aliens. TVG: Does most of your individual character growth happen when an episode specifically focuses on your character? Biggs-Dawson: Not necessarily. There is [potential] for development even if you just have a few lines in somebody else's story! because the writing is very [illuminating]. The lines are very specific to your character. You can't just hand them to anybody. Robert Picardo (Doc): I hate to disagree, but in the episode that just aired, you and I had exactly the same line: "Wait, it gets worse!" Picardo: Not that I'm disagreeing with what you said about (leans into tape recorder) OUR WONDERFUL WRITERS. Biggs-Dawson: Well, maybe our characters are related. Biggs-Dawson: Hey, we do have the same hairline! TVG: Do you feel free to take your gripes to the producers? Beltran: Garrett, why don't you tell us about your experience? Wang: Well... let's just say I'm going to stay on the bridge for the next 12 years. Beltran: It's impossible to predict what changes or suggestions the [powers that be] will go along with. Sometimes you think. "Oh, this line I can get changed. No problem," and they'll go, "Absolutely not!" Other times it's "Yeah sure, change the whole damn page if you want." TVG: OK, so Beltran flubs the most lines. Does everybody agree? Everybody at once: Uh-huh (laughter all around). Beltran: I wasn't aware of it until the other day when Garrett says to me (adopts a dorky valley-boy accent): "Duuuuude c'mon, ya gotta admit you flub more lines than all of us put together." Mulgrew: Garrett has compiled statistics on everybody. McNeill: He even knows our uniform sizes. Phillips: Gee, that's a hard question . . .
Beltran: Oooooh, that's a really hard question. Biggs-Dawson: Yeah, we gotta think real hard about that one (more laughter). Wang: Oh, great, this is just what I need. Let me just clarify. The reason I'm late is that, uh. . .I am so overwhelmed by this fine cast that I find it really hard to get out of bed in the morning. I'm not worthy of being in their presence--so I try to show up late to sabotage myself. McNeill: (to Beltran): Is that why you flub your lines? TVG: So who's the earliest? Phillips: Kate is extremely punctual, well prepared, and never flubs a line. Beltran: I've counted three times this season. Picardo: When Kate flubs a line, don't you all feel just a little better about yourselves? Picardo: Yeah, being made fun of in fourth grade doesn't hurt as much when Kate flubs a line. TVG: Do you guys monitor the chat on the Internet? Mulgrew: I think the Internet is terrifying. I hate the whole idea. What does it mean but a total loss of privacy [The fans] know everything. Wang: How do they know this stuff? Wang: I do not tell them! Wang: I cooperate, I don't tell them. I'm not leaking out any information. Picardo: No we're just kidding. But we do have a leak somewhere--a leak in the [production] office. TVG: Is there an upside to the Internet? Like instant fan reaction to an episode? Picardo: Yes, and that's a good thing. I also got the best explanation of holographic theory in Star Trek--from a fan's four-page treatise on the Internet. Before that I never quite understood how my character was supposed to work. TVG: This show has made a huge splash in the media. Picardo: Well, when you do four hours of interviews for each hour of shooting, it's bound to show. Mulgrew: (gritting her teeth): But we do it with a smile. TVG: Why is Miss Mulgrew so reluctant to make personal appearances? Mulgrew: (looking uncomfortable): I hesitate to say anything about anything because somebody inevitably gets offended! See, it's a double-edged sword for me. There are many people who feel I should attend the conventions because that's part of the job--and I do want to honor the fans. I in no way want to patronize them. But I find [conventions] a bit of a gray area. I went to one yesterday and I'm on the set today feeling exhausted. It's just not worth it. Not even to do two a year. Because something's going to suffer in my work. And that's what really drives me nuts. Picardo: You have to find a balance between honoring the history of the show and doing the work itself. You don't want the fans to think you're purposely making yourself unavailable, but, in theory, what they love the most is what's on-screen. Compromising that is not doing the fans justice. Phillips: There will be plenty of time for appearances--we'll be doing this show into the next millennium. Beltran: Unless science discovers that dilithium crystals cannot run a ship, and then our whole premise will be out the window. We'll all be out of a job. TVG: Then what will you do? Phillips: I guess we could change the title of the show to F Troop. Mulgrew: We could do Voyager Christmas specials. Picardo: I have my hair replacement clinic to fall back on. Russ: And there's always Tuvok's Psychic Hotline.